It is not going to be an easy process. Mostly infants don’t like to take anything other than breast milk. You have to be patient. It will be difficult to feed the child. So, try, try and try again until the baby starts taking bits of the new food. Try with mashed potato, carrot, apple or other vegetables in turn and see if the child is growing a liking for anything in particular. This varies from child to child. And yes, no need to Weaning food sets the foundation of food habits in babies. You should plan it in such a way that the baby grows up with a healthy food habit. It should offer adequate nutrition should be light on stomach, provide required carbohydrates, fibres, minerals and essential vitamins. Since around 6 months of age the mental and physical faculties in babies start growing rapidly. This fast-growing phase brings a paradigm shift in the infant’s nutritional requirement. Mother’s milk is not adequate to offer this nutrition. Moreover, it is around this time that the mother’s milk starts to wane. It is time that you introduce your baby to the food basket of nature and weans it off your breast milk. Introducing such food is a gradual process. There is no point in rushing in to give nutritious food. As you start weaning foods you must begin with something that is very light on tummy. Potato, carrot and apple are very good in this respect. Offer these foods in turn, not all at a time. Boil a potato, peel it, mash properly and try to feed this with a spoon. Remember, don’t add salt. Your baby’s salt requirement is met by your breast milk. Any extra salt may be a burden on its tiny kidneys. If you think that without salt mashed potato will taste bland then you are wrong. Your baby does not know the taste of anything other than breast milk. So, everything else will taste bland for it. add sugar too. Sugars undergo a lot of chemical processes and may be harmful for infants. Moreover, the natural sweetness of apple or other ripe fruits is enough for the baby to taste sweetness. 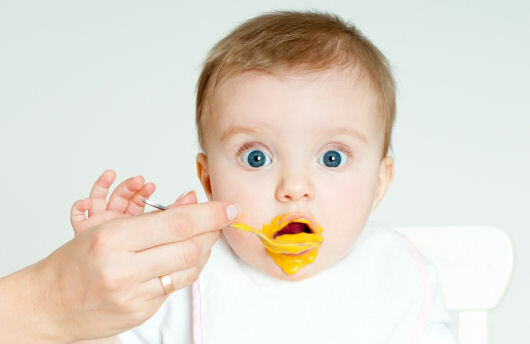 Not even honey should be added to an infant’s weaning food. When the baby is around one year of age you can add something more to its food regimen. You can add bit of salt to the semi-solid vegetables and honey to semi-solid fruits. Also, try cow milk and different seasonal fruits. Whole wheat bread is also a good option. Egg, beans and mutton liver are some of the highly nutritious weaning food that you can start at this age. You can start off with clear and fresh juices and it is advisable to choose a juice which is available round the year. In this regard, you can go on to choose apple as you need to peel one, cut it into small pieces and then go on to boil it in a pan. The apple should be smashed with your hand or a spoon. Then strain out all the juices and put it in a container. You can offer small teaspoons of it to your baby in the beginning.